Please use them and satisfy your manes who are in Pithru Loka. The following stars are affected Poordam, Hastham, Uthram, uthradam and sravanam . Tharpanam should be done before the Grahana leaves ie before 3.49 am . Since in this case it happens in the mid of night , Tharpanam can be done next morning The Grahana starts at 11.54 PM and ends at 3.49 AM in India. (Those whose Nakshatra the eclipse are affected , should write the following sloka in a palm leaf / thick paper and tie it to their forehead. After the eclipse this palm leaf/paper should be removed. Then they should give in charity one Ash gourd, coconut and coin to a Brahmin. (Navami up to 2.342 AM pm (dasami afterwards ) and aswini up to 9,48 am that day and then apabharani Nakshatra afterwards) . Continue your services sir. You services are like blessing to us who are devoid of elderly at home and around us. With waning concern and short cuts, there is lack of awareness and u/s of the rituals for those who have stayed away from home during our student days and also during our services from parents. With nuclear families and bane of the age, people who want to practice or rather who have woken up late like me in life to practice sandyavandanam,gayatri etc. it is a boon. Let Lord Shiva add many more years to your life and help serve the society at large and brahmin and those interested in practice from other communities. Namaskaram , very good info with great explanation. God Bless all. May God bless you for your great service to society ! Thank you Mr Ramachander, a much awaited updated .. Pray god to shower you with good health ... warm regards..
Kindly send the Thapanam mantras andhra procedure please if possible.Request you to kindly do the needful. I found this page by accident. Thank you very much for posting this. However, I am told by our family priest that tharpanam has to be performed every month. Can you add the missing dates please? Can you guide us with step by step procedure by adding pictures, which direction to face while doing tarpanam, the placement of koorchais on the plate etc this will be helpful for people who are abroad. Mahalaya Paksha begins on September 25th , September 28th is maha Bharani.People who need the tharpana manthras for any day during Mahalaya may send me an e mail requesting the manthras) May I request you to kindly send me the manthras to my email ID <subra_59@rediffmail.com. Yajur Iyer. Further, I also request you to send me the tharpana manthras for all the Mahalaya days to my mail ID devakymurthy@gmail.com. Sir, Thank you so much for helping our community by compiling the tharpanam mantra each year for the past many years and I have always used your site. Can you please send me the same for 2018 paksham to my email id "shanky1972@yahoo.com"
Would it be possible for you to send me the mahalayam Tharpanam sankalpam for 29th Sept 2018. Sir, when i was searching for dakshinayana or uthrayana information, it landed to your blog. Really impressive and we will pray almighty to bestow abundant blessings to you and your family. Please keep guiding us. Sir,You are a Boon to this society. When people are forgetting our Tradition, you are striving to continue and Help us protect it. Your explanations are So easy to practise and perform i have become your Follower. My Pranamams to you. 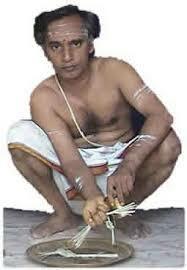 By the way i am a Vadakalai Iyengar using your kind service for Tharpanams. Thank You Sir. Thank you for the excellent service you are rendering. Namaskaram. Kindly inform me the correct pronounciation of samaveda srartham. Nowadays Samaveda sastrigal is not available in my area. Jaya Jaya Sankara. PRR Mama our heartful namakarams to you. Very uaeful. Am following for the last few years.periyavaa charanam.